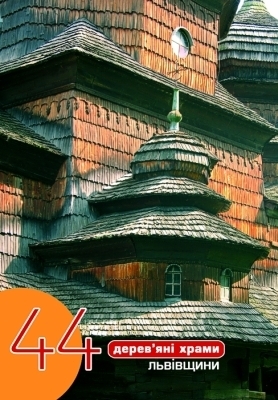 A guide-book "44 wooden churches of Lviv region"
This book is not only the first travel guide to wooden churches of Lviv region but, generally, the first Ukrainian guide dedicated exclusively to the monuments of wooden architecture. The guide is illustrated with schematic maps and recent photos; first and foremost, it caters for travellers, and that's why the choice of objects is somewhat offbeat. The five routs include all known to the author and touristically interesting wooden monuments of Lviv region - from medieval churches in Drohobych to little Polish Roman Catholic churches of the 20th century - that have up to now preserved the picturesqueness and charm of old times. The author of the guide, Olena Krushynska, is the owner of the President's of Ukraine grant for the talented youth for realization of the project "Creation of an internet portal and a photo catalogue of wooden architecture monuments "Wooden Churches of Ukraine" (2006-2007); the travel guide was written in the scope of this project. A part of the printed copies was published by the means of the President's of Ukraine grant for the talented youth and distributed among professionals, non-government and research monument preservation organizations and institutions.